Where you can see the difference! The expert opticians at Barnett Opticians are prepared to help you get the most out of your eyeglass prescription from your optometrist or ophthalmologist. Your eye doctor is an expert in eye health, our ABO certified opticians are experts in lenses and the technology available to get the maximum benefit from your new prescription. Optician Syl Schied has over 50 years of experience in the optical industry, and all of our opticians have at least 10 years of experience. The opticians at Barnett will listen to your needs and apply the latest optical lens technology to optimize your new prescription glasses for your best vision. Barnett Opticians has the largest selection of prescription eyeglass frames in the area. With over 1500 frames and sunglasses in stock, we have about twice the amount found in a typical optical store. When combined with our premium lenses custom fit and adjusted by our skilled opticians, you get Barnett quality eyeglasses you can not buy anywhere else. Barnett Opticians is an independent family owned and operated business with a reputation for quality products and service. No-gimmick everyday pricing means you will never overpay for your eyeglasses, and you do not have to wait for the right “sale” for your needs. We believe where you purchase your eyeglasses is more important than what products you buy. Even the best products will not work correctly if not applied and adjusted by skilled opticians. You can trust the optical experts at Barnett Opticians to let you see your best. 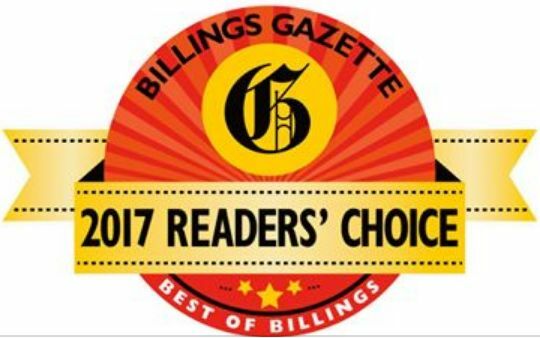 Thank you for voting us Billings Gazette Readers' Choice Best Optical Store. 2017, 2016, 2015, 2014, 2013, 2012, 2011, 2010, 2009, 2007, 2005, 2002. Scheduled Saturdays 9:00 - 1:00, call ahead. Visa, MasterCard, Discover, American Express and Care Credit accepted. Medicare, Medicaid, HELP, Blue Cross, EBMS, Pacific Source, Allegiance, VSP, VA, and other insurances billed for you.